Political will and good partnership between the provincial government of Albay and the coastal communities in the province have been greatly responsible for the restoration of coral reefs in Albay Gulf. Heavily damaged by blast fishing activities in the past, these coral reefs are progressively coming back to life as the local folk have turned wardens of the seas and closely working with the provincial government to bring back healthy reefs for the coming generation. A few years after the provincial government established the marine sanctuary as a marine reservation and designated it as a protected area in the province, a new garden of healthy corals has been seen growing tremendously in place of the damaged corals, based on the assessment of a group of sea environmentalists and scuba divers here. The sanctuary lies in the waters of barangays Manaet, Buang, Uson and Pongco Bonga in Cagraray Island, Bacacay town. Divers from the Pacific Blue Dive Center led by Jin Masuda, a Japanese currently living in Legazpi City and diver Emmanuel Salazar, once explored the waters off Barangay Manaet. They uncovered the new garden of corals beneath the Cagraray Pass, the eco-tourism haven of Albay province. Masuda’s group scoured the waters off Manaet while local communities and village officials and a composite team of the Armed Forces of the Philippines, journalists, Office of Civil Defense Bicol led by director Bernardo Alejandro and Department of Environment and Natural Resources employees planted 5,000 mangrove propagules to reforest the denuded area of Manaet’s shorelines. The activity was done during the first week of June in consonance with the World Environment Day and National Environment Month celebration of the provincial government of Albay to support the greening program of the government aimed at helping lessen the adverse impact of global warming. “We dived up to 200-300 meters down into the reefs and saw around different kinds of fish and coral. Approximately 80-90 percent of the corals were badly damaged. The possible cause of the damages is blast fishing done in the past or very strong waves during typhoons,” Masuda said in his assessment report. “A new garden of corals has started to grow in damaged corals sites. What I found were corals that are starting to grow. They are of different kind and seems to be stronger under murky water,” he said. Masuda said there are few areas where the corals are not so damaged and have good corals with shoals of tropical fishes during their dive. 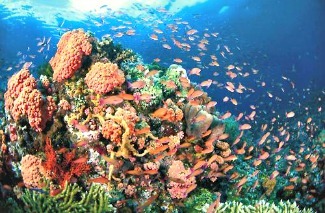 The dive was done in the northwest reef, some 500 meters away from the shorelines of Manaet. Edwin Belano, village chieftain, said residents of Manaet and neighboring areas are now strictly watching over the waters off Albay Gulf to prevent the repetition of the illegal fishing activities in the past. “Fish is getting expensive nowadays because of dwindling marine resources. So, we need to act together to save what is left for our children’s children. All of us nurture our surroundings. People from all ages and walks of life work together as guardians of the seas so that illegal fishing will not flourish again like in the past,” Belano said. He said they have strictly prohibited fishing in the declared fish sanctuary. Cagraray Island in Bacacay town was declared by then President Fidel V. Ramos as an eco-tourism site. The island is host to the world-class, luxurious Misibis Bay Resort of Bicolano business tycoon Elizaldy “Zaldy” Co. The resort is being targeted as a venue for ministerial sessions during the Asia-Pacific Economic Cooperation Summit in 2015. Scuba divers in Albay have identified 16 dive sites in Albay Gulf and parts of Legazpi City’s coastal areas which are now being promoted as a tourist destination here. Romeo “Nong” Dawal, Albay provincial consultant for marine eco-tourism under the Albay Millennium Development Goals Office (AMDGO), said 10 of the 16 dive sites are found in Cagraray Pass, within the territorial waters of Albay Gulf at the eastern seaboard of the province. The six other sites have been discovered in Legazpi City. These, he said, are free from strong currents. The provincial government, through the AMDGO, commissioned Pacific Blue, an organization of professional scuba divers, to conduct rapid marine assessment survey to check the status of corals in Albay. Part of the project is the promotion of capacity building of local communities through a divers’ training course for open water and corral gardening. Dawal said skilled community-based divers will be deputized as dive guides and wardens of the corals and vast area of fish sanctuary. The coral gardening program has developed low-tech, cost-effective systems for growing and transplanting corals to restore degraded reefs here. Through this scheme, nurseries are established by trimming coral fragments from existing wild populations then securing them on underwater structures. “The best way to save reefs is through carefully managed human impact and interaction with them, and let local people who know the reefs best take ownership of the cultivation of the flora and fauna, ‘planting’ missing key species of coral–fish or shellfish–to ensure the reef’s survival as an ecosystem,” Dawal said.